Next up on the Weekend Warmup, we are very happy to welcome South Korean producer and DJ: Honbul. Have a read below, as we talk about his musical background, sample digging, and what he’s got in store for 2014. Be sure to check the hour long mix of hip hop, left field, and funk he’s left for us below, featuring a couple of the man’s own productions. Please introduce yourself. How did you get started with DJing and producing? I’m Dong-Geun Kang aka Honbul from S.Korea. I started DJing when I moved to LA to study jazz guitar at the Musicians Institute when I was 18. I met some friends who were into the rave scene, and they started taking me to some parties. Those experiences totally blew my mind. So I decided to buy some decks off Ebay and taught myself how to DJ. 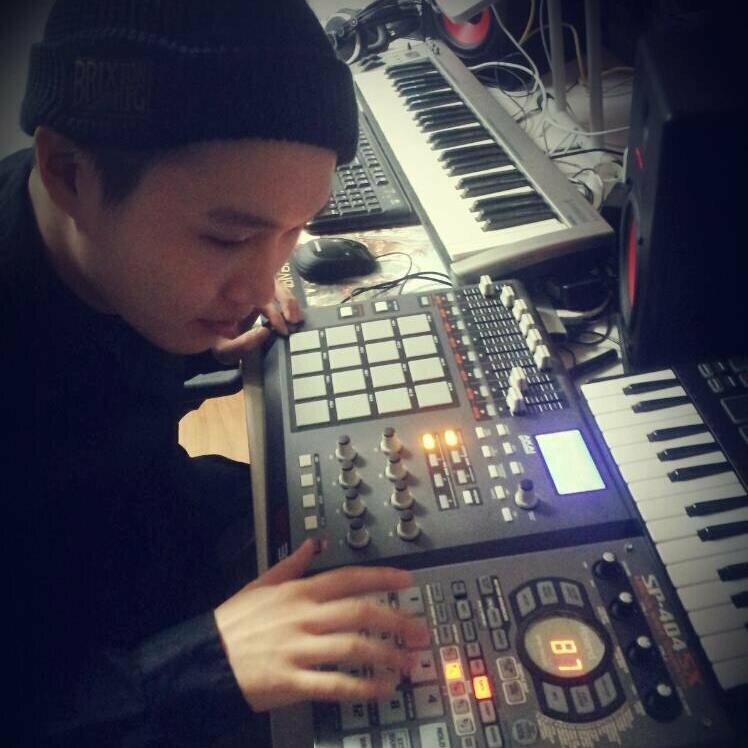 At the time i didn’t know anything about music production and I wasn’t really interested. However later on I got bored of just DJing and started wondering how these producers make their sounds. This was around the time I started making music, which was about 2 years ago in 2012. Any specific DJs or artists really stick out for you from your first few raves? Well I was really digging Dubstep, like Bassnectar and Skrillex. I thought those sounds were amazing, but then I went to a Flying Lotus’ gig, and was exposed to a new world of music. It was magical. As I mentioned my musical background is based in jazz, but I was also interested in some experimental sounds as well, like Post Rock and Dark Ambient. I think my original influences led me back to more organic sounds, produced by the likes of J Dilla, Madlib, Flying Lotus and many more. Lets talk about your jazz background a bit. How do you feel it has influenced your music? Do you feel that it has been helpful to have some of that theory and knowledge behind you? Yeah it has been very helpful, but sometimes I wish i didn’t know so many technical elements, because every time I play some notes or get samples off of records I tend to analyze them, thinking of chords and scales. I don’t want my music to be too structured, so I try to forget what I’ve learned sometimes. Some of your productions definitely have a sample based, old Hip Hop vibe to them. Where do you dig up most of your samples? I’m more of an ‘E-Digger’ because I travel a lot. Oh and I get lots of samples from games as well, I play games a lot. So how do you approach writing music? What is your production setup lookin’ like? I’m using a laptop, MPD 32, and a midi keyboard. Usually I just listen to records til I get an idea, then chop the parts and play around with them using the drumpad until it becomes a loop. Sometimes If a beat or a melody pops into my head I’ll sing into my phone and work on it later. Singing eh? Can we expect some soulful lyrics in future Honbul productions? Haha, I have to say I’m a terrible singer, but the wonders of technology can enhance anything, so never say never. Any collabs going on with singers, producers, or other artists? Who would you really like to work with? No not at the moment, but I’d really like to work with some good lyricists or singers if I get the chance. Have you been playing many gigs around Seoul recently? Any specific gig that was particularly memorable? I played a couple of gigs, but Seoul crowds aren’t too used to the kind of music that I play. The club scene here is saturated with EDM, Dubstep, Brostep, you name it. Drum & Bass is slowly being embraced but I’m sure you’ve heard the stories of a lot of famous DJs getting kicked off the decks after less than an hour. This sometimes happens because the DJs weren’t playing the typical ‘hands in the air’ stuff crowds here are used to. Actually it’s hard to get a gig that I really want to play and enjoy. I’m not too bothered though as I’d like to stay home and focus on my production and playing games. You can check out a recent live mix I did for the ‘Aircon Room’, Asia’s version of the Boiler room. So you have some travel plans for the coming year? What is 2014 looking like for Honbul? I’m going to visit New Zealand in June for a while to chill out on some farms and beaches. Hoping the fresh environment will give me some new inspiration. Haha bahhh… and where can people find your tunes? You can listen to a couple of tracks on my soundcloud, I’ve got some new tunes in the pipeline which i’ll be posting up soon. Thanks again to Honbul for stopping by. Connect with Honbul on Soundcloud and be sure to have a listen to the hour long mix he’s left for us below! 13. Black Milk - Sonny Jr.